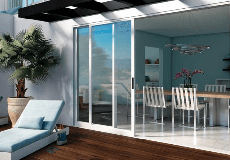 Fusion Windows is a leading Los Angeles area window and door replacement and installation business. We are headquartered in Burbank, CA, (northeast Los Angeles) and we are licensed, bonded and insured. Our California Contractors License number is 956355. Fusion Windows specializes in retrofit instllations as well as new construction. FUSION WINDOWS & DOORS is rated 4.6 out of 5 by 23. Rated 5 out of 5 by arsenjan818 from Excellent Service on Doors & Windows I'm very happy to have selected Fusion Windows & Doors. Tigran and his teams came out to the property and checked everything themselves prior to placing the order. The process was extremely convenient and I'm very happy with the results. Thanks guys! We'll definitely refer to friends and family! Rated 5 out of 5 by Michael M from Great showroom full of options !Knowledgeable ! After shopping around I came across Fussion windows on yelp . Made an appointment with A salesperson and visited their showroom . They have a very large and beautiful showroom that’s full of options .The staff is super knowledgeable and quick. Delivery was done within days and installation was seamless! Rated 5 out of 5 by Garik from Best In Los Angeles I did a brand new construction in La Canada CA. Shopped around for windows and door. No one gave me a better deal, Fusions professional installers did the job on time & with superior craftsmanship. Rated 1 out of 5 by aimhigh01 from Ignoring calls/e-mails I rec'd a quote for my condo when I visited their establishment. Then, the condo assoc. req'd a detailed cost quote for their right wing 12 street windows (4 in each floor). I e-mailed the rep, I followed up with calls regarding their request, and, I never got a courtesy call back. I spoke to other reps this past week, but it seems like they don't want to get involved since is not their sale. Because each rep has their quotes restricted in their computers, no one else can help other clients if a question comes. We will take our business somewhere else. Rated 5 out of 5 by Rogue2217 from Extremely Pleased Extremely pleased with the outcome of my home. Fusion did an exceptional job without any issues. Thank you guys! Rated 5 out of 5 by Stac from Best Experience We are so pleased and amazed with the service we got, Fusion helped us pick the right windows for our home, we were absolutely clueless about the products, they were very detail oriented and straightforward with us. They helped us every step of the way, very professional and timely. Installations were a breeze, very clean job. Most importantly everyone we spoke to was very friendly, they answered all of our questions and helped us with all of our concerns. I recommend them to everyone I know. Definitely call Vahan at Fusion! !